In an earlier post (Springtail Computer Games – January 2011) I reported on the games designed and created at the Springtail Studios located in Romania. Their Haluz and Haluz2 games are free to play online. This post highlights Springtail’s Alchemia game, for both PC and Mac. The playable character in the game, for a reason that is obvious when you first see the character, is named Noses. A patrolling flying machine snatches his roasting chicken dinner. Noses knocks the bandit out of the air with a well-thrown hatchet and the flying thief crash lands in the nearby forest. Upon reaching the crash site, hoping to retrieve his dinner, Noses meets Lootpecker, the ghost in the machine. Lootpecker bemoans the fact that it can no longer hunt and asks Noses for his help in obtaining a new body. Thus begins their adventure. The following video solves Noses’ first problem. He needs to follow Lootpecker through the opening yellow arrow) in the upper-right corner. To do so, Noses makes use of the tractor. Climbing aboard, he starts the tractor’s engine, puts in the clutch, shifts to first gear, steps on the gas pedal and drives the tractor forward. A brick, previously hidden under the tractor, is now revealed. Noses picks up the brick, shifts into reverse and backs the tractor back to where it was initially parked. Shifting back into first gear, he sets the brick on the gas pedal and, as the tractor moves forward, grabs the rising chain. By tugging on the track control, he is carried through the opening, into the next chamber, and immediately faces the next problem to solve. I read the Manual and discovered that it explains why kids are much better problem-solvers than adults when playing these games. Kids will click on everything, aren’t afraid of doing something wrong, and will never read the manual. 1. Click on everything and see what happens. 2. You can’t do anything wrong in the game. 3. If you think you did something wrong, see point 2. Points 5 through 10 tell the player to lighten up and go with points 1 through 4. Attention to detail is the key to the game. In one level, an apple tree quickly goes through a year of growth. Picking up fallen apples is what’s needed to complete the level. I’ve played through the first seven levels with grandsons John and Andrew. 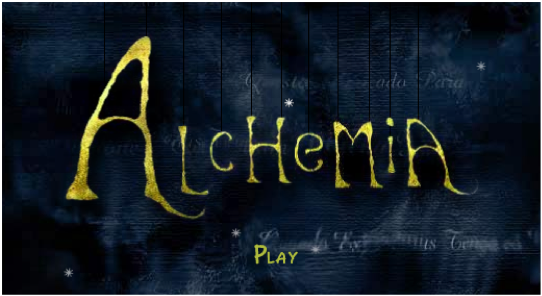 During our next visit, we will finish Alchemia as our bedtime story game. If the frustration level gets too high, click on the Walkthrough button for a detailed solution to the level. When you leave the game and return at a later time, typing in a Level Code lets you start where you left the game. All in all, at $7, the game is real bargain. 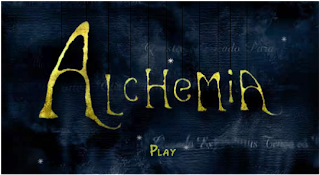 Play the demo online at http://www.alchemiagame.com/ where you can also download the extended version.